There is a chance that Ukraine may end up breaking up into several smaller states later this year, said Dmytro Yarosh, a Ukrainian lawmaker and the former head of the extremist Right Sector organization. 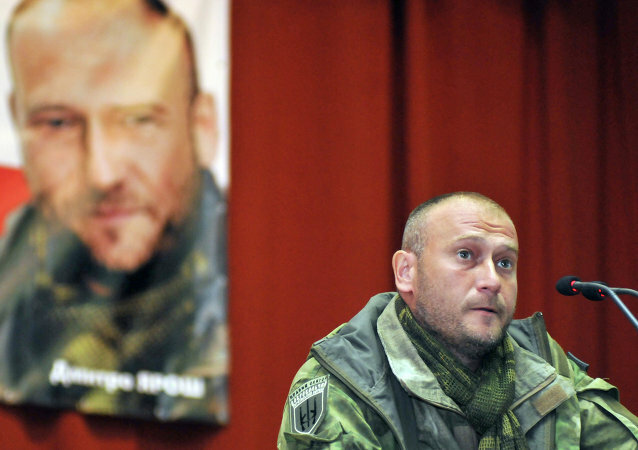 Citing numerous wounds as a reason, Right Sector leader Dmytro Yarosh stepped down, saying that he remained "a nationalist, statist and revolutionary". 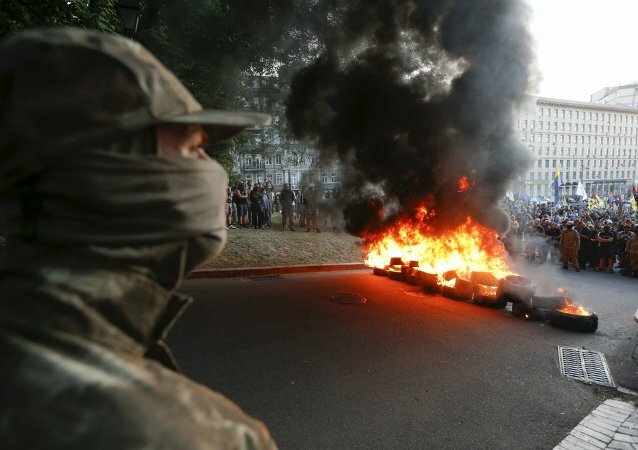 An increasing dissatisfaction by Ukrainians with the state’s inability to cope with the current problems is playing into the hands of far-right radicals, who are stepping out against Kiev and may inspire a new revolution that will eventually result in the collapse of Ukraine. 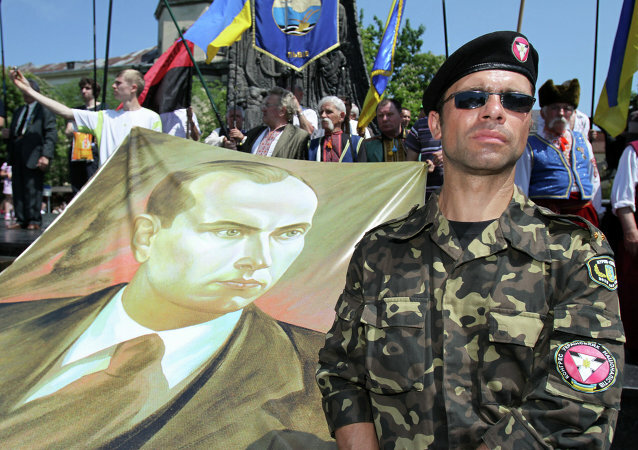 Ukraine has started publishing school notebooks with the image of Stepan Bandera, the notorious founder of the Ukrainian nationalist movement, and Dmytro Yarosh, the current leader of the Right Sector, an ultra-nationalist militant group, according to Ukrainian political scientist Konstantin Bondarenko. 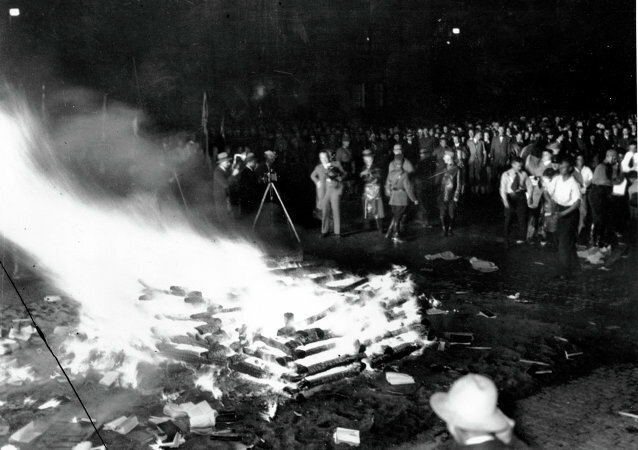 It hasn’t quite got to the point of burning books – yet – but the latest move by the Western-backed regime in Kiev to ban dozens of Russian and opposition Ukrainian authors has a grim historical echo. 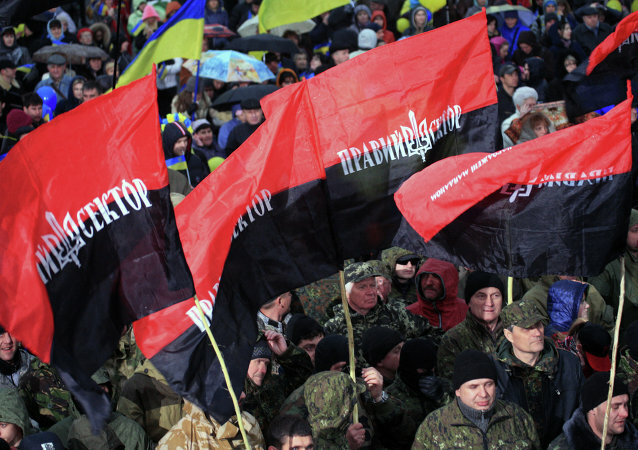 The activities of the Right Sector ultranationalist group are exacerbating what is already a complicated political situation in Ukraine, a German Foreign Ministry spokesman said Wednesday. There is a new Maidan “revolution” now in the making in Ukraine, the head of the State Duma’s foreign affairs committee warned on Tuesday. Dmytro Yarosh, leader of the Ukrainian radical movement Right Sector, has reportedly called for the resignation of the country's President Petro Poroshenko. 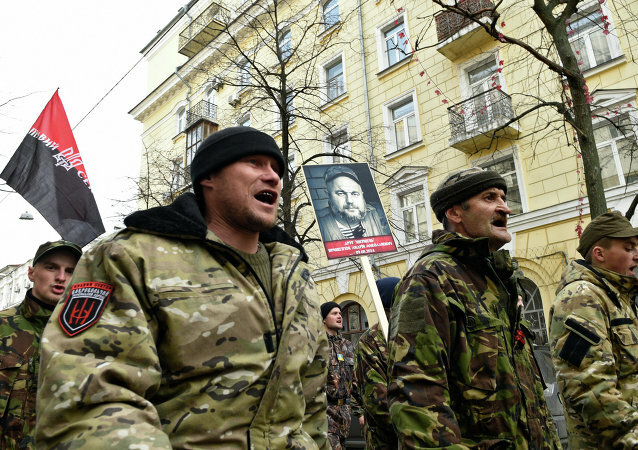 Ukraine teeters on the brink of a new conflict, this time in the West of the country: Right Sector nationalists tossed a challenge to the authorities, nearly declaring a war against them, Der Spiegel said. The EU is afraid that the conflict may spread to Romania, Hungary and Slovakia. 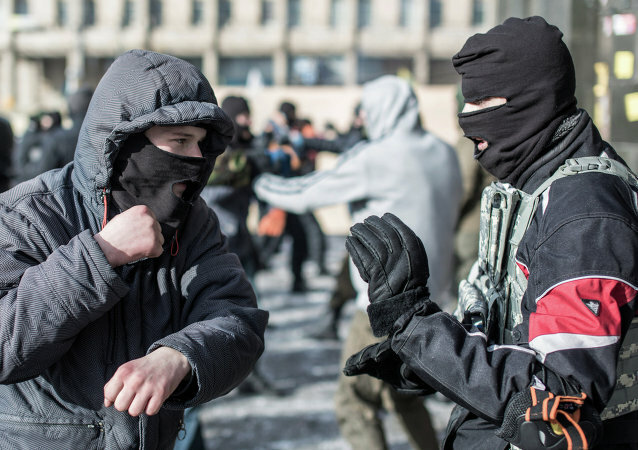 On Saturday, the Ukrainian Right Sector far-right movement began protests in several Ukrainian cities, including Kiev and Lviv, following a police shootout involving its members in the Ukrainian southwestern city of Mukachevo that had left at least three dead and 13 injured. Right Sector head Dmytro Yarosh has arrived to the western Ukrainian city where a standoff between the group and Ukrainian police is becoming increasingly tense. 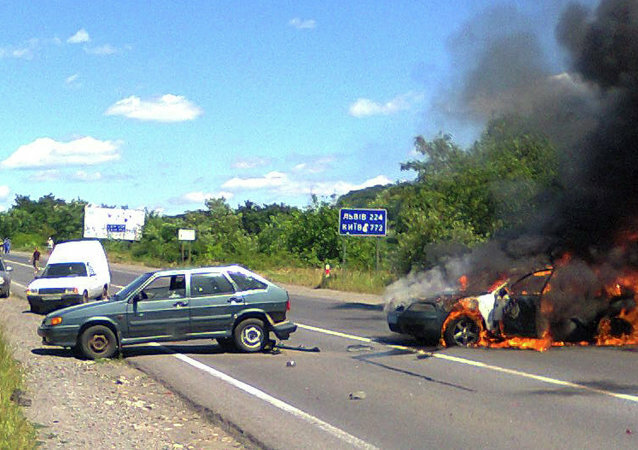 Ukraine has reportedly begun moving military vehicles into a western Ukrainian town where a deadly standoff took place between nationalists and local police over cigarette smuggling. The leader of Ukraine's ultranationalist Right Sector movement has called on his fighters to continue protests and political actions across Ukraine until those responsible in the deadly shootout in the Ukrainian town of Mukachevo are arrested and the country’s Interior Minister Arsen Avakov steps down. Leader of Ukraine's Right Sector far-right movement Dmytro Yarosh called for the immediate detention of those policemen who opened fire on members of Right Sector in the Ukrainian town of Mukacheve. Analyzing the results of Saturday's botched gay pride parade in the Ukrainian capital, Ukrainian experts have suggested that Kiev's 'gay safari', as the march was referred to by members of the Right Sector, may have become the match sparking an outright war between President Petro Poroshenko and the radical nationalist group. The Right Sector nationalist group has found a new enemy to cross swords with - a looming LGBT pride march in Kiev. The leader turned the tables on Europe for the moral decay of the Ukrainian nation. Obama has thrown in the sponge for Ukraine, Eric Zuesse underscored, adding that Washington is now "on-board with the ‘Plan B’ for Ukraine," which means implementing the provisions of the Minsk II accord. 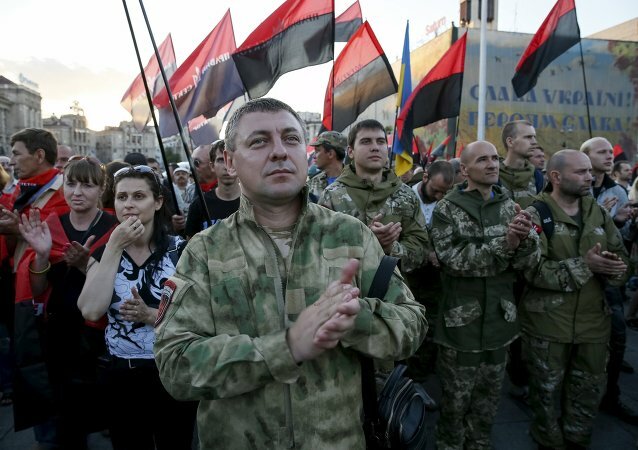 Right Sector nationalists continue to flirt with the Ukrainian armed forces. Here is why they need it and what they can teach the regular army. Russian Foreign Minister Sergei Lavrov said that Ukraine's President Petro Poroshenko needs to stand up for his rightfulness and thus neutralize those who want to plunge Ukraine into a civil war once again.